The weather deck was where Victory was navigated, sailed and directed in action. The quartermaster and his mates turned the wheel to keep the ship on course - or to alter course as directed by the officer of the watch or the sailing master (a senior warrant officer responsible for sailing the ship). Two compasses were kept in the cabinet in front of the wheel - illuminated at night by a dim lantern. Turning the wheel took up and released rope connected to the tiller (a long lever) below - this moved the tiller fror side to side and turned the rudder. On either side of the wheel are officer's cabins - the sailing master to port and the captain's secretary to starboard. Behind the wheel is the entrance to the captain's day and night cabins. 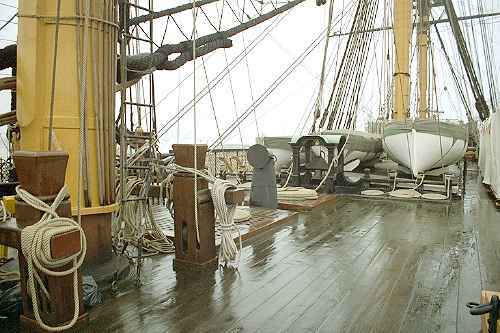 Above and astern of the quarterdeck is the poop deck, above the Captain's quarters. From the poop deck the officers took navigational sightings and directed the flying of signal flags. Midshipmen with telescopes kept a sharp eye out for signals flown by other ships - and decoded their meaning using signal code books. During battle, the Admiral directed the action from either the poop or quarter decks. Admiral Nelson was on the quarterdeck when he was shot by a French marksman at the Battle of Trafalgar (1805). Wounded by the musket ball, he was carried below where he died from his wounds three hours later. 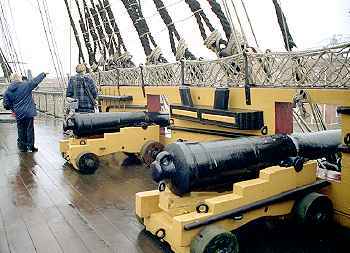 The quarter deck was lined with 12 pounder cannon - the heavier cannon were mounted lower down where their weight would stabilise the ship. Hammocks were lashed up and stowed in the nets above the bulwarks each morning - in action the rolled hammocks provided some protection against splinters and shrapnel. Boarding pikes were stowed around the masts - within easy reach when the ship came alongside an enemy in battle. The ships boats were stowed forward of the quarter deck - over the open space above the upper gun deck. In action these would be a dangerous source of flying splinters so they were often lowered over the side and towed astern.